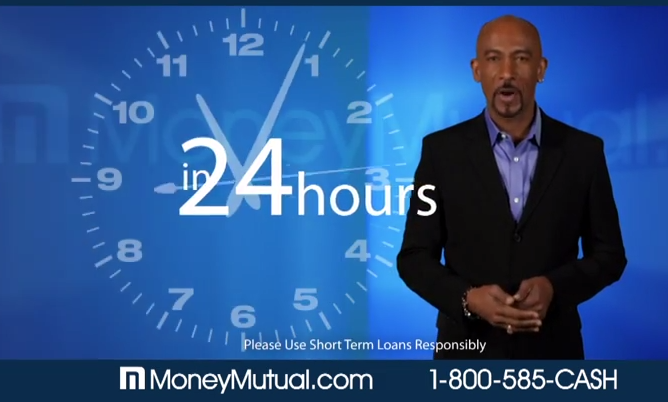 Celebrity spokesperson Montel Williams clearly avows that Money Mutual, headquartered in Las Vegas, Nevada, functions as a payday loan lender network as opposed to being a direct lender. Is this loan a good deal for borrowers? Money Mutual offers to connect potential borrowers with lenders that will supply a maximum of $1,000 via direct deposit into the customer’s checking account within 24 hours following completion of the online application. Money Mutual’s online application is encryption certified and holds membership in the Online Lenders Alliance. With customer service available 24/7/365 by email and phone, the network’s business motto may be described as being by your side from the first application keystroke to the ultimate in customer satisfaction. In several places on its website, Money Mutual admonishes prospective borrowers that, as a lender network, they can not and do not guarantee an exact APR and advise that the average rate for a 14-day loan is 261 to 1,304 percent. Money Mutual and its parent company, Selling Sources LLC, have instituted a set of guidelines and regulatory statutes that far outweigh those of their competitors. Sitejabber.com maintains that they have received no official response relative to 72 negative Money Market consumer reviews. Sitejabber also cites a constantly-changing list of approved lenders, but fails to direct potential customers to Money Mutual’s Q&A section where this and other issues are clearly addressed and concisely answered. Lenders enrolled in the Money Mutual network are authorized to offer a maximum initial loan of $1,000 to be deposited in the borrower’s checking account within 24 hours on normal business days. 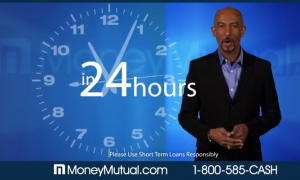 Montel Williams cautions website visitors not to fall for “1 hour approval” ads or promises promoted by numerous payday loan entities. United States Federal Banking ordinances require banks and credit unions to place a hold on deposits for 24 hours before making these funds available to account holders. In addition to rules set forth by federal and individual state financial regulatory bodies, Money Mutual strictly abides by its own Code of Lender Conduct. Clauses in this code include: (a) no dissemination of data in any form to anyone, (b) lenders must provide consumers with the availability of customer service contact by telephone, (c) lenders must address all customer concerns and issues within two business days and (d) lenders must supply clear, concise and full disclosure relative to their individual lending policies and guidelines. Furthermore, Money Mutual firmly states and exercises their right to terminate or suspend lender participation within the company network. Consisting of approximately 60 approved short-term lenders, basic borrower requirements are being 18 years of age, having a source of income generated by employment or the receipt of a monthly pension in the amount of at least $800 and an active checking account into which the loan deposit will be made. Individuals who are self-employed are required to supply the name and telephone number of their main income source. With the online loan market expected to increase in usage by 62 percent in 2016, up from 35 percent in 2010, lender networks must comply with Consumer Protection Regulations including voluntarily supplying the source of lead generation purchases. Research indicates that the cost to lenders for each lead averages $50 to $150. Network agencies must adhere to guidelines set forth by the Military Lending Act 2006. While not intended to stop military personnel from applying for payday loans, the act functions as a safety-net regardless of where stationed. Payday loans, also known as short-term loans, are currently allowed outright in 27 states and with minor restrictions related to the issuance of post-dated checks in nine other states. The practice is banned in the District of Columbia and the remaining 14 states. Money Mutual’s payday loans may be a good solution for those who urgently need quick cash from time to time. However, consumers are strongly urged to read the fine print of any agreement they receive from a network-approved lender. This data includes information regarding timely repayment, availability of repayment alternatives and that the lender has the right to review the applicant’s credit history. The non-public lending institutions give you all the money you would like but they currently have far larger interest rates.